The Tarim River, running over 1,321km across Xinjiang Uyghur Autonomous Region, is China’s longest inland river. With a total area of 1.02 million km2 1, the Tarim River Basin is equivalent to the size of Ethiopia, or twice of Thailand or Spain. At its centre is China’s largest desert, Taklimakan Desert. Water resources from the Tarim River mainstream and its tributaries are vital for both human development and the region’s ecosystems. It is no coincidence that the middle and southern routes of the Silk Roads overlap with river flows of the Tarim (see map below). 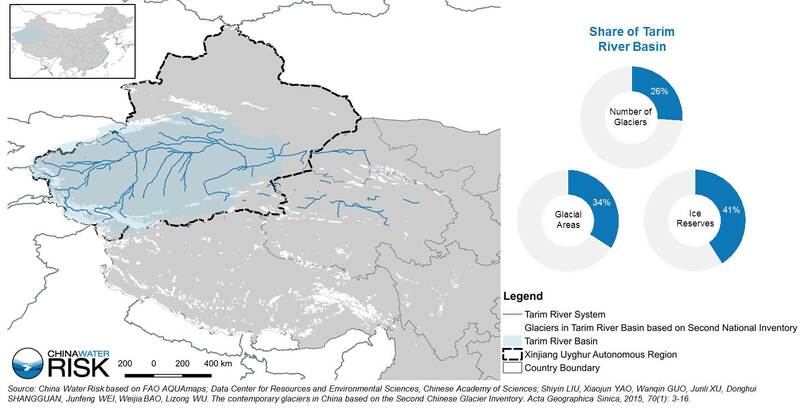 According to China’s Second Glacial Inventory, the Tarim River Basin holds 12,664 glaciers, with total glacial areas of 17,650km2 and total ice reserves of 1,841.27km3. This is about 26% of China’s total number of glaciers, or 34% in terms of glacial areas and 41% in terms of total volume2,3 (see map below). 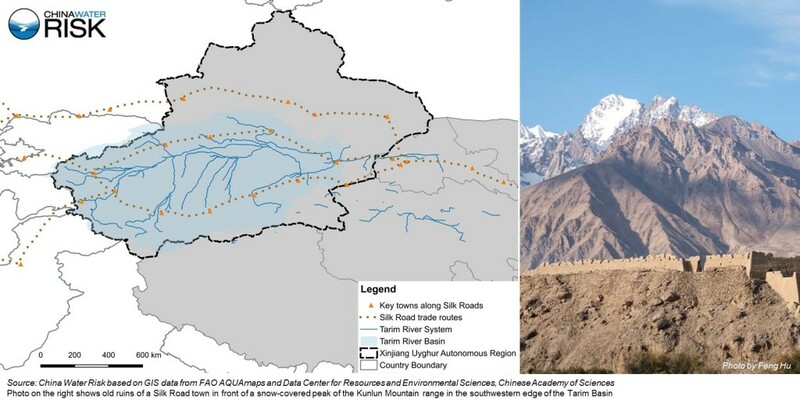 In particular, the Tien Shan mountains in the northern border of the Tarim Basin hold the biggest share of glaciers with a total area of 15,416-16,427km2 and are thus called the ‘Water Tower’ of Central Asia4. With such huge body of glaciers, it is not only important for China, but also key for the entire Hindu Kush Himalayan (HKH) region in terms of climate change and the cryosphere. Indeed, according to the GLIMS Glacier Database, the largest glacier in the entire HKH Region is the Yinsugaiti Glacier within the Tarim River Basin. In fact, 11 out of the top 15 largest glaciers in terms of area in the HKH Region are located within the Tarim Basin. Although the Tarim River Basin holds significant volume of ice reserves, the region in fact faces serious water challenges. Due to the existence of the Taklimakan Desert, the annual average evaporation in the Tarim River Basin is over 3,000mm, but its annual average precipitation is only 60mm!5 The Tarim River used to have 9 tributaries formed by in total 144 rivers. However, currently, only three rivers – Kotan, Yarkand and Aksu River – are still connected with the surface water of the Tarim River mainstream1. 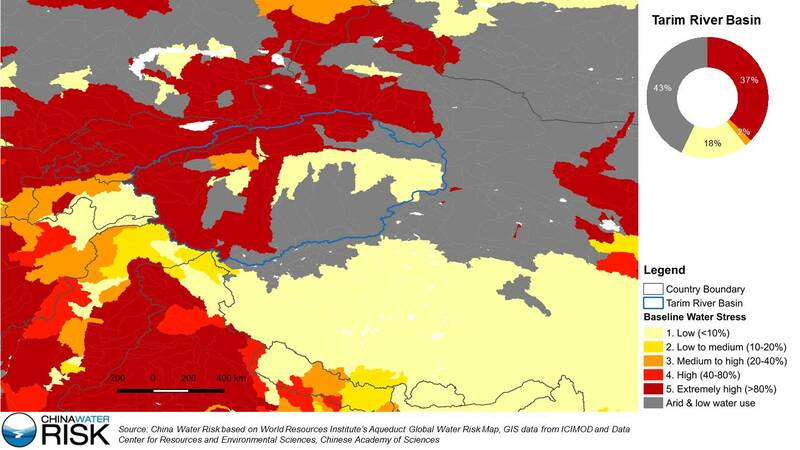 According to WRI’s Aqueduct Global Water Risk Map, 37% of the areas in the Tarim River Basin fall under the ‘extremely high’ water stress category, meaning that the ratio of water withdrawal and available water resources exceeds 80%. Moreover, because of the Taklimakan Desert, 43% of the Tarim River is also categorised as ‘arid’ or ‘low water use’. This means that if we exclude the desert areas, over half of the rest of the Basin face extremely high water stress. Despite its natural geography and climate condition, rapid development of agriculture and industrial production and expansion of cities since 1960s exacerbated its water scarcity. Xinjiang’s total population rose from 6.86 million in 1960 to nearly 24 million in 2016. About half of its population live in the Tarim River Basin. Meanwhile, unsustainable use of water resources also didn’t help. Since 1970s, the downstream of the Tarim River has experienced cut-off due to excessive water withdrawal in the upstream. Agriculture (mainly irrigation) is the largest water user, accounting for up to 95% of Xinjiang’s total water use. One of the biggest irrigation needs comes from cotton farming. As of 2016, cotton accounts for nearly a third (34.6%) of Xinjiang’s total sown areas. Xinjiang’s total cotton production reached at least 3.6mn tonnes (provincial sources states 4.2mn tonnes), representing 78.6% of the national total. The trend of the past 25 years clearly shows that Xinjiang aims to become the next textile hub. Policies were also issued in recent years to encourage textile manufacturing. Most of the cotton farms are located in the Tarim River Basin, due to the availability of water resources. Its annual average production is estimated to be over 2 million tonnes, more than a third of China’s total production. This also makes the Tarim Basin one of the world’s largest cotton production regions. In a 2018-2025 plan of developing high-quality cotton production bases in Xinjiang, which is under drafting, southwestern and northwestern parts of the Tarim Basin are identified as key regions, along with the northern plains of the Tien Shan mountain range. Over the past 5 years, over 15.88 million mu (~1 million hectares) of farmland in Xinjiang have been equipped with highly efficient water saving measures and equipment, accounting for 54% of its total irrigated areas. Average irrigation efficiency rose from 0.49 in 2012 to 0.527 in 2016, and water use per mu of irrigated area dropped from 680m3 in 2012 to 610m3 in 2016. This means over 1.1 billion m3 of irrigation water was saved in 2016 due to efficiency improvement, equivalent to the 2030 total water use cap along the Tarim River mainstream. Thirdly, mobilise more private finance by promoting PPP projects. 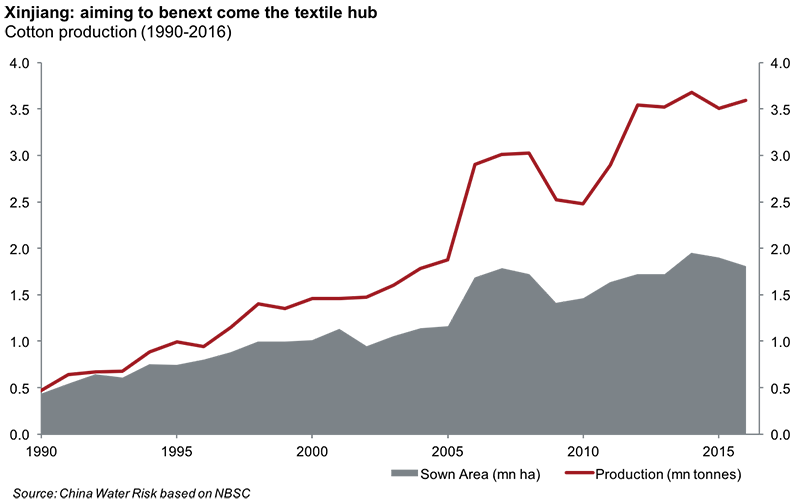 By April 2017, there were 60 PPP projects planned for 2017-2020 in Xinjiang with a total investment of RMB46 billion. 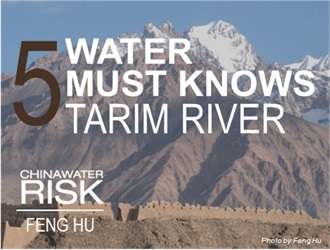 Two thirds of these investment, RMB31 billion, will be for projects in the Tarim River Basin. Of this, over 77% will be spent on building reservoirs, and another 22% on water supply & allocation projects (see charts below). Compared to other major rivers such as the Yangtze and the Yellow, the Tarim River Basin was not an early mover in basin-level management. However, water resources constraints forced the local authority to adopt a basin approach on water management. The Tarim River Basin Bureau (塔里木河流域管理局) was only set up in 1991 to coordinate and manage efforts on ecological protection of the river basin. However, over the past two to three decades, river management has progressed quickly from forming high-level administration body to river-specific legislation (see timeline below). China’s first local-level river basin water management regulation, the Tarim River Basin Water Resources Management Regulation (塔里木河流域水资源管理条例) was issued in 1997. Since then, this regulation has undergone two amendments, in 2005 and 2014 respectively. Since 2016, Xinjiang has also started to fully implement the Most Stringent Water Management system. ‘Red Line’ targets on total water use by 2030 have also been assigned to each sub-basin of the Tarim. Moreover, other innovative water management mechanisms, such as water rights trading and ‘River Chief’ system, are also being implemented. With 37% of the basin area facing ‘extremely high’ water stress, the pressure to get water management is more urgent in the Tarim. The region, with its strategic importance to China, must find its balance between water security and economic development. 1 Yu-fei, X., Guang-peng, Z., Chao-qun, C., Hai-liang, X. & Hong-bo, L. Effectiveness Evaluation of the Unified Management Based on Water Change in Tarim River Basin. J. Nat. Resour. 31, 1806–1816 (2016). 2 Liu, S. et al. The contemporary glaciers in China based on the Second Chinese Glacier Inventory (’基于第二次冰川编目的中国冰川现状’). Acta Geogr. Sin. 70, 3–16 (2015). 4 Sorg, A., Bolch, T., Stoffel, M., Solomina, O. & Beniston, M. Climate change impacts on glaciers and runoff in Tien Shan (Central Asia). Nat. Clim. Chang. 2, 725–731 (2012). 5 陈曦 et al. 塔里木河近期综合治理工程生态成效评估. 中国科学院院刊 32, 20–28 (2017). China's River Chiefs: Who Are They?